Bulgaria has an extremely rich tradition of arts and crafts – with many items and techniques unique to particular regions or towns. 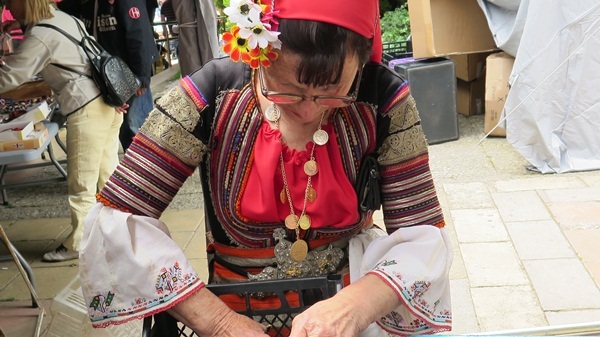 By looking at the craft traditions of Bulgaria, you’ll be able to learn a huge amount about the traditions and beliefs of the people… as well as the lifestyles of Bulgarian people throughout history. My tours of Bulgarian arts and crafts have been designed to offer you a rich, valuable insight into a world gone by! On my Bulgarian art and craft tours we’ll visit museums, merchants, historical buildings and craft workshops. You’ll get to see traditional forms of art and architecture, pottery, carpentry and early tools. We’ll learn about Bulgarian embroidery too, and look at the way Bulgarian women used to express the beautiful world around them through painstaking work with a needle and coloured threads. We can visit the famous celebration of traditional crafts known as the Oreshak Fair, or tour the Etar museum park near Gabrovo: a large and vibrant ethnographic complex. At Veliko Tarnovo you can even watch craftsmen create traditional-style orthodox icons! And of course, there’ll be plenty of opportunities to pick up some unique souvenirs during one of my Bulgarian arts and crafts tours! I’ll be very happy to help you create a personalised tour of local handicraft sites. I can pick you up from any city in Bulgaria, for a fully customised tour – anything from a day trip, to a multi-day adventure through the colourful world of Bulgarian arts and crafts! Bulgarian pottery makers are still famous and their works are worthwhile souvenirs. In the past, Troyan, Gabrovo, Teteven were renowned centers of pottery making. Etching, or drawing straight lines on pottery items, was common, and later multicolored patterns spread on pots, jugs etc. produced by Bulgarian potters. Nowadays applications also contribute to the decoration of pottery items. Icon painting was an art which had its numerous followers. It derived its roots from the adoption of Christian faith in Bulgaria in the ninth and tenth centuries. Continuing throughout centuries, it evolved into a tradition which reached its peaks during the second Bulgarian Kingdom. Initially characterized by asceticism, Bulgarian icons started to become truer to life, with fuller faces and landscapes forming the backgrounds. Heavy crowns and baroque thrones were introduced, and the colors became more vivid and brighter. Towns like Tryavna, Bansko, Samokov were important centers of icon painting. Woodworking went along with the making of staple items of furniture and utensils to decorate them and make them more attractive. Even shepherds’ pipes were enticingly decorated. The chests in Bulgarian homes, kids’ cradles, cribs and cots were decorated with patterns involving leaves, flowers, and although men created them, they were exquisite renditions of the genius of nature. Wooden spoons, stools, and diverse musical instruments, all featured carved patterns which made each wooden item a work of art. The Tryavna school, in the small town of Tryavna in the folds of the Balkan Range, has invariably been the hub of woodcarving. 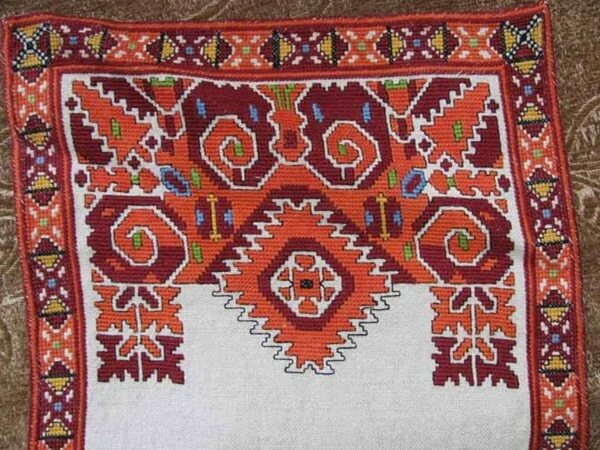 Bulgarian embroidery is characterized by the ample use of geometrical shapes. They are arranged along hemlines, necklines, on tablecloths, table runners, to form continuous lines of colors which add lots of rainbow hues to white shirts and cloths which decorate the home. Plants are omnipresent in Bulgarian embroidery, as nature has always surrounded Bulgarian households and been a mighty source of inspiration. Crafts and arts in Bulgaria have been linked with smithery. Coppersmithery produced cauldrons, coffee pots, diverse dishes, were carefully shaped and decorated. Whereas in copper items objects for everyday use were produced and decorated to let beauty into everyday life, goldsmithery was dedicated entirely to decorating. Goldsmiths relied on the traditions observed by ancient Thracians and developed in the centuries, and added plant elements and geometrical shapes. Weaving and carpet making are also traditional Bulgarian crafts which are also true arts. Bulgarian women were skilled weavers who created their own patterns and color combinations. Carpet making has a long history in the country, dating as far ago as the ninth century. The major centers of carpet making in towns such as Kotel and Chiprovtsi are still famed for that craft. People who look at the carpets produced in these two towns will notice that Kotel carpets are characterized by large patterns, whereas those of Chiprovtsi are smaller. Rugs woven in the Rhodope mountain are another area of art and craft blended, with long fringes colored in white, yellow and brown. Weaving has produced smaller items which nevertheless explode in color symphonies – pillowcases, aprons, bags, belts are worth acquiring. The Etar museum park on the outskirts of the town of Gabrovo, central Bulgaria, is a veritable nook of peace and quiet, with craftsmen and artists at work, ready to show off their skills before the visitors. That is a smaller scale model of what Gabrovo looked like in the past, a museum in the open. The houses feature the style of revival architecture, with two storeys and workshops on the first floor. The craftsmen and artists manufacture and sell their items, so aficionados of uniquely produced items can take home souvenirs made of metal, leather, clay, wool, etc. In the ethnographic complex in the town of Zlatograd, in the Rhodope mountain, people find themselves in another museum in the open. That is the first private such complex. Visitors can watch the making of clothes: national costumes characteristics for all regions of the country. The complex also offers numerous souvenirs from hand woven fabrics, bells, leather items, beads jewelry. The exhibition of photos shows old irons, sewing machines, scissors. People can also see goldsmiths, coppersmiths, woodcarvers and other craftsmen at work. Could you suggest a day tour to visit potters workshops?